New for February 2014! We've added a second example, sniffing the power dissipated in a Wilkinson isolation load. 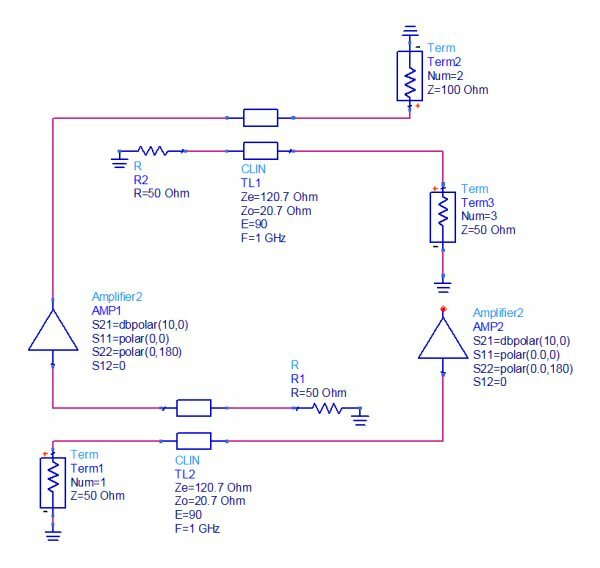 The Microwaves101 "sniffer" circuit is indispensable for determining reflection coefficients inside of designs that just can't be broken down into cascaded two-port networks. "Classic" ways to use the circuit are to to reveal what a FET sees inside a feedback loop, or to determine what reflection coefficient is seen by an amplifier in a balanced pair. 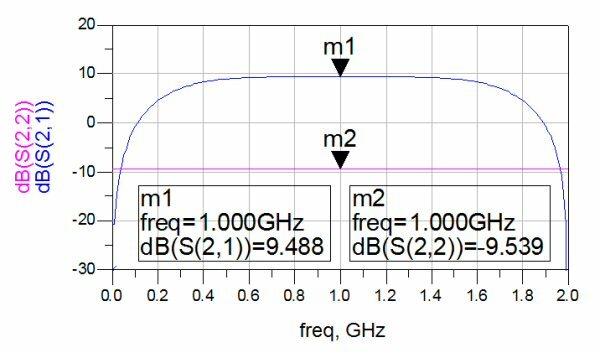 Balanced amplifiers have two advantages over in-phase combiner schemes, one being the disappearing reflection coefficient and the other being the insensitivity to load-pull effects. It is equally disturbing that none of the popular EDA tools have this fundamental capability built in. 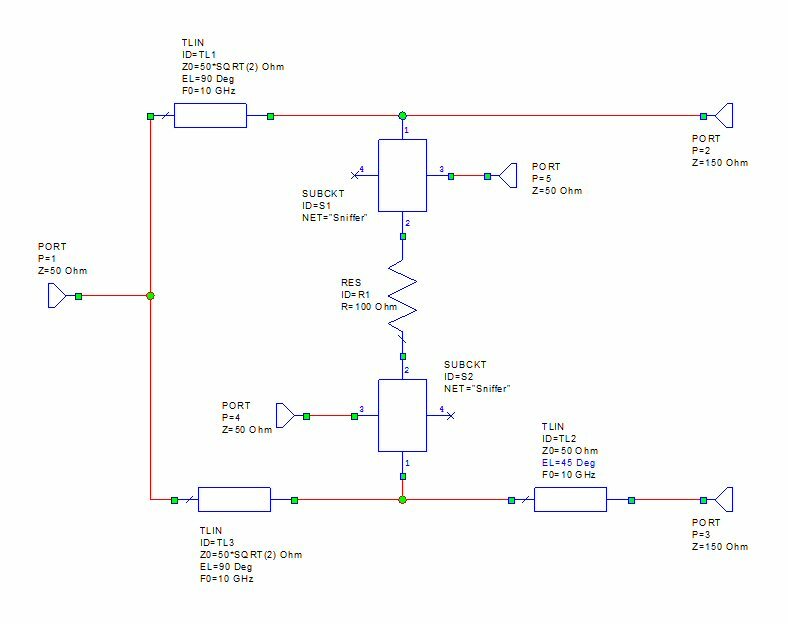 For our example we will look at a mismatched balanced amp design (ADS schematic shown below), which uses ideal coupled-line couplers to provide quadrature split. Here the output is terminated in 100 ohms when the design is expecting 50 ohms, a 2:1 mismatch. If you want more exact values for Ze and Zo for perfect 3 dB coupling, use 120.71067812 and 20.71067812. We calculated those values from a cool spreadsheet that you can find in our download area. From our VSWR calculator, the mismatch loss should be 0.51 dB. This is confirmed in the predicted response below. 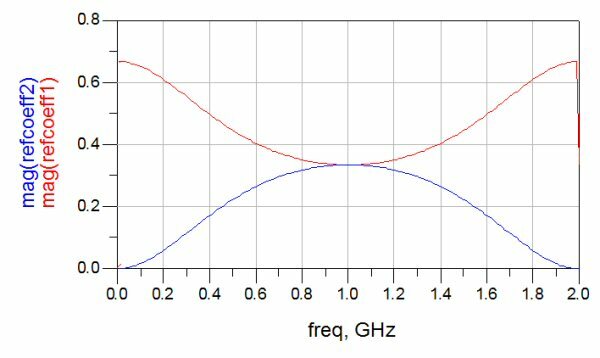 Suppose you wanted to determine what the amplifier on the left saw for a reflection coefficient? An example of what not to do is to break the circuit and add a terminating port. Come on, we've all done stupid stuff this, some of us just try not to admit it unless caught! Here's the result.. if you didn't know any better, you'd probably come up with a rule of thumb that the amplifiers see 6 dB better return loss than the mismatch (2:1 VSWR is equivalent to -9.569 dB). But you'd be wrong! By breaking the circuit, you have disturbed its operation. So how can you "measure" the reflection coefficient without breaking the circuit? Enter the Sniffer! The sniffer is an ideal four-port circuit, non-realizable because it breaks the conservation of energy rule, but in a good way. We named it the Sniffer, for no good reason, other than it sniffs the reflection coefficient without taking a bite out of it. For any signal incident on port 1, equal phase and amplitude signals exit port 2 and port 3. For any signal incident on port 2, equal phase and amplitude signals exit port 1 and port 4. Thus the ratio S31/S21 is the forward reflection coefficient, and S42/S12 is the reverse reflection coefficient. Ports 1 and 2 can be connected anywhere in a network without any performance effect, the Sniffer has zero loss, zero reflection and zero phase shift between these ports. It may return a warning from your EDA simulator that it is non-realizable, just ignore this. In case you wanted to create the Sniffer as a "Touchstone" S-parameter file, just cut and paste the S-parameters below, it will work from 1 MHz to 1 THz. Be sure to name it something.S4P, the file extension is usually important. If we made it any easier for you, you should be fired for being so lazy! Now we install two Sniffer circuits into the design file and add equations to compute the two reflection coefficients inside the balance amplifier without breaking the network. 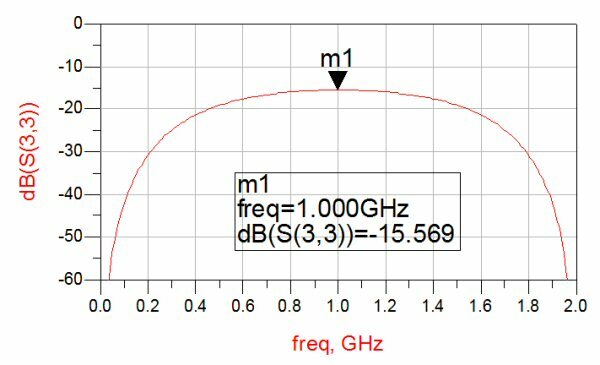 Sure enough, the reflection coefficients are 0.333 which indicts that the mismatch is 2:1 at the center frequency, or -9.54 dB. If you don't understand that statement, please read our main page on VSWR. 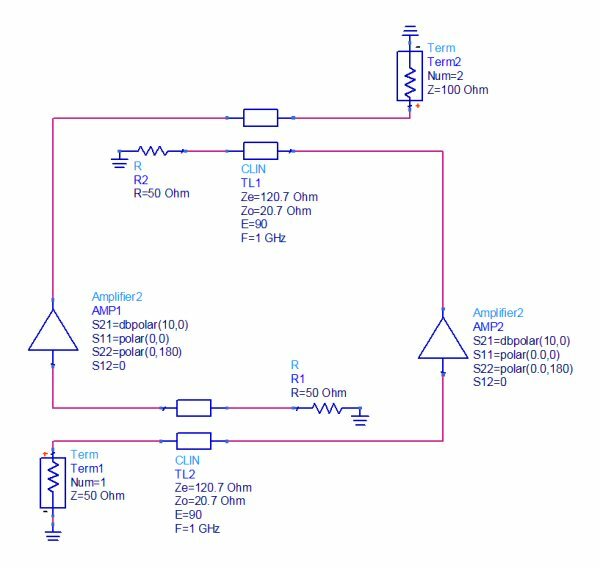 The Sniffer circuit can be used to assist in Steve Cripps' analysis of power amplifier load lines and in a feedback amplifier, as another example. It's about time we created a page on Cripps' technique, isn't it? Everyone knows that under ideal conditions, the load in a Wilkinson dissipates zero power. It's only there to match S22 and S33, right? Wrong, Kimo Sabe. 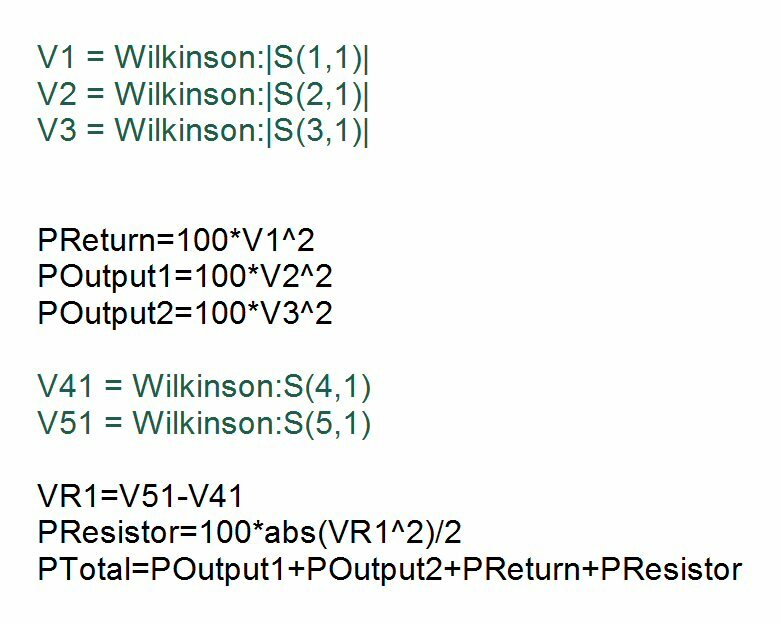 Sizing the resistor on a Wilkinson for power is something that every engineer has ignored or done incorrectly in his/her career. To be fair, a good engineer might be able to figure out the dissipation at center frequency with a pencil and paper, but they are unlikely to solve what happens over frequency before their attention is diverted to some other problem. 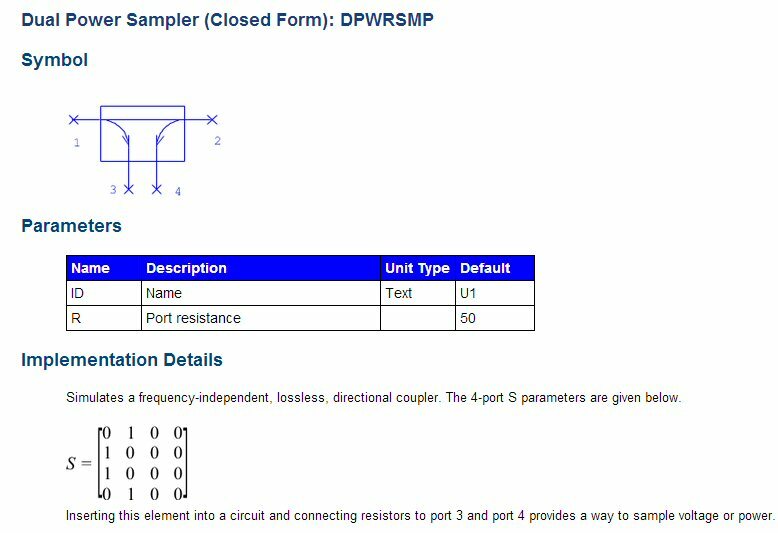 Recently the Unknown Editor contacted MWO support and asked how to measure the dissipation in a Wilkinson resistor. As usual, he received some good advice, the solution was to use the harmonic balance simulator, which allows you to measure the dissipation of any element in a circuit. That's great if you happen to own the harmonic balance simulator, but what if you don't? Power dissipation analysis can also be done using the Sniffer. Yes, it is using a wrench for a hammer if harmonic balance is available, but playing around with the Sniffer imparts a better understanding of what S-parameters are all about. We didn't know about the Dual Power Sampler when we wrote the following example, using it would not change the result. Below is a simple 50 ohm Wilkinson centered at 10 GHz, with two "Sniffer" circuits implanted around the isolation load. Note that we turned the lower one upside down, which was not really necessary but we thought it might be more consistent to access Port 3 on both of them (rather than Port 3 on the top and Port 4 on the bottom Sniffer). In the overall schematic, Port 5 represent the voltage at the top of the resistor, and Port 4 represents the voltage at the bottom of it, relative to the input voltage at Port 1. Note that we made the port impedances on the right side both 150 ohms to set up a 3:1 VSWR. Driving 3:1 loads in-phase does not dissipate anything in the load, you have to make them out of phase. Therefore we put in a 45 degree (fifty ohm) line on Port 3 so that the reflection from Port 3 is 90 degrees out of phase from the reflection from Port 2. Next we had to concoct some equations. V1, V2 and V3 are the voltages at ports 1, 2 and 3 with respect to incident voltage on Port 1. We took the absolute values of these voltages so we don't have to deal with vectors. From these we can calculate the returned power and the two output powers as shown. V41 and V51 are the voltages that come out of the two Sniffers, if you subtract them the voltage across the resistor is revealed. We took the absolute value of the resistor voltage and squared it to get power. The total power is added up from the four components as a check to see if the technique works. Below is a plot of the relative dissipations in percent of what entered Port 1. 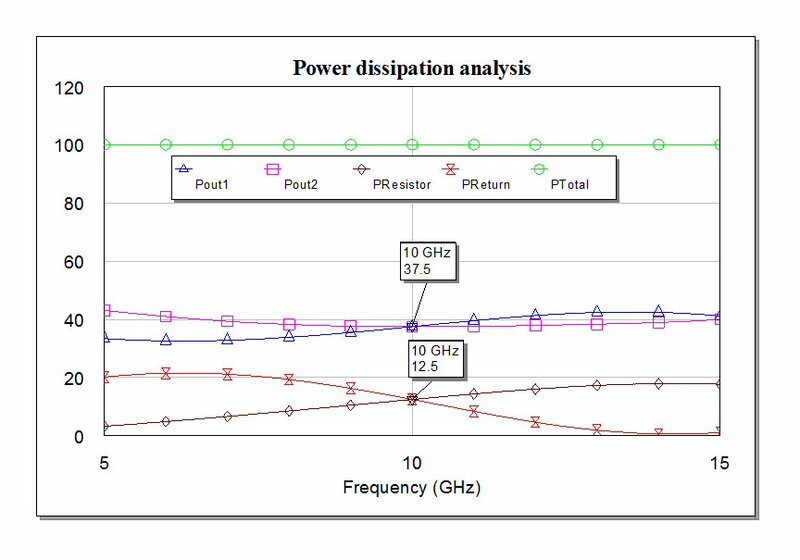 At center frequency, the returned power is 12.5%, as is the dissipation in the resistor, or 1/8 of the incident power. Each 150 ohm port on the output is delivered 37.5% of the incident power. Note that it all adds up to 100% (green circled line). Note that as you go off center frequency, the resistor dissipation changes. It is wise to size it for worst case across frequency, which is close to 20% in the example. If you are driving that Wilkinson with 5 watts, the resistor needs to be sized and heat sunk for 1 watt. Good luck with that! 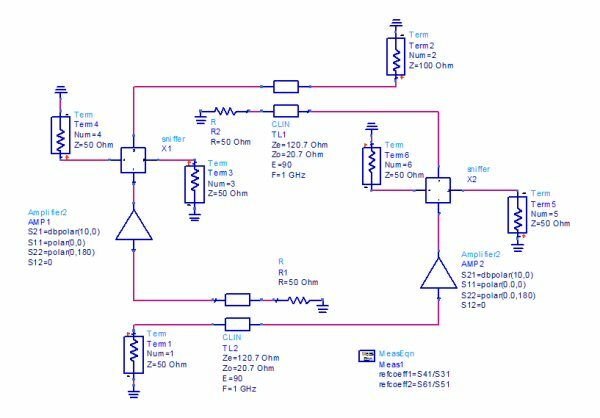 It is obvious that you could do the same analysis to the resistor in the output of a power combiner, we won't spoil your fun here. 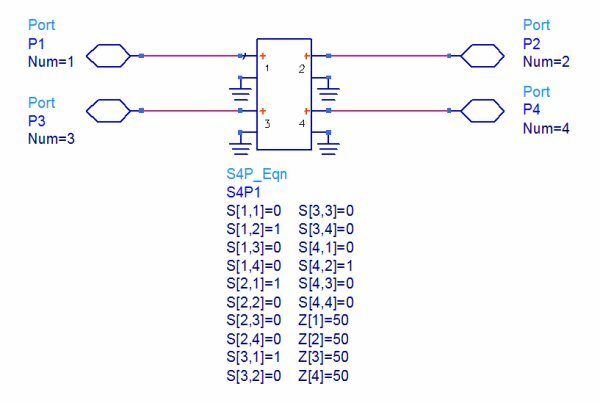 To do this accurately you will need statistics on the phase angles of the constituent amplifiers, something that not all MMIC foundries are willing to part with. When your power amplifier looks into a poor reflection coefficient, some more power will stress the resistor. The Sniffer will tell you all you need to know. I find the VCVS is also handy for measuring the signal across elements. Give it a high Zin, a 50 Ohm Zout, and a gain of two, and you have a high impedance differential probe. 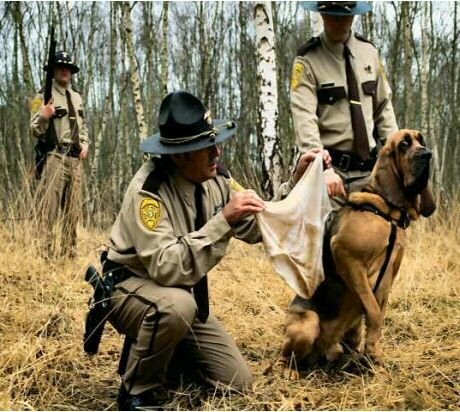 What else can you do with the Sniffer? How about measuring the dissipation in a resistor in an feedback circuit? Of course you can do that! We'll pay fifty bucks for the first person to submit a valid example!